This really nice Davy Crockett Water Tumbler, maker unknown. 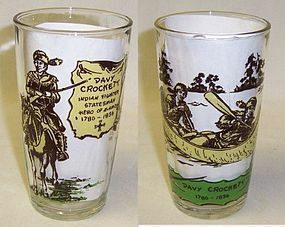 This Tumbler is clear with brown, yellow and green picture of Davy Crockett on his horse and in his canoe. It measures 5 1/8 inches high X 2 7/8 inches in diameter at the top. On the tumbler is DAVY CROCKETT - INDIAN FIGHTER - STATESMAN - HERO OF THE ALAMO - 1786-1836. This tumbler is in very good condition with no chips or cracks. The design and lettering is all very good. We guarantee all items to be as described. Feel free to email any questions. THANK YOU.